It rarely happens that a software update killing one of feature of product. Well this will be happing with iPad, a popular tablet from Apple. 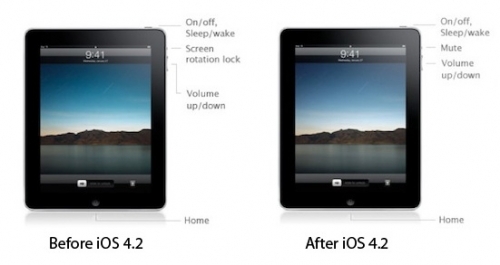 iOS 4.2 which is scheduled for release this November for all idevices (iPhone, iPod Touch & iPad) will transform screen rotation lock switch present at the right side of iPad to mute switch. Considering the purpose of switch can be changed with just software update it would be wise for Apple to provide setting to select purpose of switch, unfortunately Apple is not looking to add any such setting for iPad in iOS 4.2 confirmed by Steve Jobs via email reply to 9to5mac reader Robert. In IOS 4.2 for iPad is the switch on the side going to be the mute and not screen orientation lock from now on? Are you planning to make that a changeable option? Pingback: Apple iOS 4.2 Due on Friday? It is horrible to do that. It seems that I have to Jail break and switch my plan to get a iphone4 instead of a Android. i think since they introduce rotation lock when you double click home button, it does make sense not to confuse user with another hardware lock button e.g. button on ‘up’ position means unlocked, ‘down’ means locked, will this override the lock via home button?